Can’t believe it’s almost like >this< to the end of the year on this side of the world… and even less time on the other side of the world. Actually, by the time I wake up again, it will be 2009 on that side of the world most likely. One oft he few things I feel I’ve done is YAM [help yourself to some leftover YAM] – and I would like to continue with that. As a special something, this is a little of what we talked on the issue. Let the Right One In, the Swedish film… which is probably MY favorite film of the year. Though, I saw The Curious Case of Benjamin Button last night and WHOA. Blew me away… but that’s not on YAM. LOL – What’s on YAM? There are also reviews on Blindness, Slumdog Millionaire, and Twilight. Yes, Julyssa decided to review Twilight for us… how brave of her! xD – And yes, please? Go watch Slumdog Millionaire (or Benjamin Button) at least once, instead of watching Twilight for the 20th time… just like Lainey says. I also reviewed music… Britney’s comeback Circus, Marit Larsen, Guns N’ Roses, Taylor Swift and DBSK. There are music, film and tv news… also a review on Season 3 of Dexter. PLUS! There’s more! Book reviews!! One of them features Yu! So please do! DO READ YAM! And link a post there so more people can read YAM. Happy New 2009. Much success to everyone! I just got some PB news, which I will talk in a minute. That made me wonder if Aoi Miyazaki had any PBs, so I went to YesAsia to look it up. Amazon.co.jp has it also listed, and at +$115 … will Shipping get u from behind though? 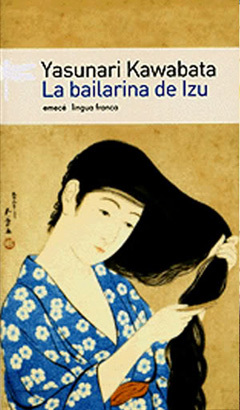 Also known as Izu no Odoriko, or The Izu Dancer is the first published work (1926) to achieve popularity and acclaimed by Yasunari Kawabata. The book, very much like Kyoto, is about nothing at all… in fact, this is just a compilation of stories put together. The first one, which gives the name to the book is one of the few interesting ones, as well as Diario de mi Decimosexto Año that tells some of the moments of Kawabata’s dying grandfather. Some other stories I liked were La Princesa del Palacio Dragón, El Camino de Monedas, and Una Oración en Lengua Materna. Despite that, the just over 200-page book seemed to be a very long and slow book, compared to the reading time it took me to finish Kyoto. If you are a fan of Yasunari Kawabata’s writing about a time and a place and the people, you might enjoy this compilation of stories. If you’re looking for an introduction to him, or an epic tale about Japan… you might want to skip this one. So the apartment where me lives is getting new paint, so me is crashing on the other side. They painted the ceiling today, and ARGH!! The paint splattered all over my graphic and photography books… of all the books I had, it had to stain the graphic and photography books. WTF! It splattered all over my Juri Ueno A Piacere, it stained my Yu Aoi Travel Sand and Dandelion… lucky for Yu, those two have plastic cover and they covered the Kaiten TABURU PB… but my Juri PB wasn’t so lucky… neither was my Mario Testino book, or some of my other heavily graphic books. I thought you’re supposed to cover all stuff with plastic… so how the xxxx do they splattered on THOSE books.